In our latest video interview, Jonathan Mitchell, CIO and business process improvement director at Rolls-Royce, talks to ComputerWeekly.com about the changing role of the CIO in today's business environment. In our latest video interview, Jonathan Mitchell, CIO and Business Process Improvement Director at world famous aeroplane engine manufacturer Rolls Royce, talks to ComputerWeekly.com about the changing role of the CIO in today's business environment. 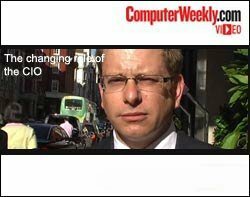 As well as Mitchell's view on the changing nature of the CIO's role today, we asked other IT directors at the Computer Weekly 500 club monthly meeting whether they felt the role of CIO was more of an IT function or whether it was more of a business role. It's true that CIOs are acting as "agents of change" in many companies. I think that these days it takes someone with both a technical background and business savvy to navigate the relationship between business and IT.